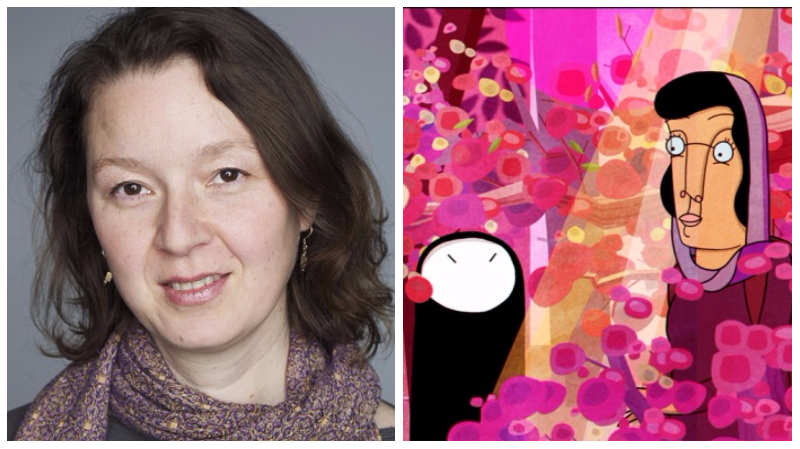 At a time where multiple nations are battling xenophobia and striving to achieve tolerance and cultural exchange, Asian-Canadian filmmaker Ann Marie Fleming brings an animated marvel, Window Horses: The Poetic Persian Epiphany of Rosie Ming, that couldn’t have come at a more interesting time. Hollywood at large, and the animation industry specifically, is trying to have a better representation of female voices, and very few female filmmakers have made it in the animation industry let alone this year’s Animated Feature Oscar race. One of the 26 eligible features in this year’s race, Window Horses is also a rare animated feature directed by a woman and vying for one of the 5 spots this year. Along with The Breadwinner’s Nora Twomey, Window Horses features powerful female characters with a clear purpose and wonderful determination. At this year’s Dubai International Film Festival, AwardsWatch sat down with Fleming to chat about her feature film which has just won the Asia Screen Pacific Award for Best Animated Feature. AW: Oscar voters are inundated with piles of screeners every year and this year’s race includes 26 eligible animated features. Why do you think your film stands out from the pack? Fleming: I think why this film is so important is that it addresses how it’s essential to be open and tolerant, at a time where we’re having such a shrill environment internationally. We need gentle voices, voices of kindness to guide us through. Personally, I’m mixed race and I lived in many different places. Stories about diaspora and how we can build bridges between cultures always interest me – and that’s what motivated me to make the film. The most important thing the world needs today is to listen – to listen to one another and be open to such experience. The film presents the story of a young woman who travels to Iran and by listening to others, she finds her own voice. AW: The film is mostly a story about ‘the others’ who are so different from us, whether in skin color, backgrounds, nationality or beliefs, and how even we all have so much in common despite our differences. Tell us more about that. Fleming: In my character design, the central character is just a stick figure (with barely any features unlike traditional protagonists of animated features) and no matter where she goes, she is the other. I think deep down inside, maybe we all feel like the other at some point – we may feel a distance from other people even if they come from the same culture or background, and we may resort to defining ourselves positively or negatively by objectifying other people. When that happens on a grander scale, it becomes a really negative experience for everybody. With Window Horses, I wanted to explore where that feeling comes from and explore it in-depth. The film also addresses how poetry – and art in general – can be a wonderful medium to achieve piece in these dark times and to tell, accept and share stories from different cultures and promote a more tolerant environment where through the written word, we understand and accept those different from us. AW: Several trades, notably Variety, said that ‘Window Horses’ is a great example of the role that art can play in fighting xenophobia and cultural stereotypes – an increasingly essential topic to address in today’s world. When you came up with the story, were you trying to address contemporary problems the world is currently facing or did it come as a coincidence? Fleming: When I started working on the story, it was before the current US administration. As the film came out, Trump’s travel ban was all over the news. During that time, I felt the country is reaching its highest levels of Islamophobia and actually “Iran-ophobia”. We rarely see any positive images of Iran in the media, where is the beauty of the Iranian culture? And why aren’t we seeing this anywhere? That’s why in the film, I made sure the character goes through the fear and confusion of visiting Iran which she never knew, only to discover how she can find a place there and feel welcome and embraced. It later becomes a part of who she is. That’s what makes Window Horses a celebration of multicultural experiences and their positive impact on individuals. AW: Tell us about your major ASPA win just days ago! Fleming: I actually didn’t think I would be eligible to be nominated for the Asia Screen Pacific Awards, especially since the film is a Canada production and it’s not traditionally included. But the fact I was born in Okinawa, and that I’m half Asian, made the film eligible. I was able to attend the ceremony, and I showed up just because I was invited. I did not expect the win at all, especially that we were up with huge animated contenders including Japan’s Your Name. (which broke all box office records). It was a wonderful moment. AW: Finally, for Oscar voters reading this interview and have not seen ‘Window Horses,’ how and where can they watch the film? Fleming: I would recommend they get in touch with the film’s US distributor, Oliver Ike from First Pond Entertainment or the National Film Board of Canada (NFP) who are my co-producers on the film. We’re currently working on raising the film’s profile and despite having very few resources, we’re trying to get the film noticed and appreciated. Word of mouth has been great so far – and the New York Times recently featured the film in its Critics’ Pick which has been wonderful news. The film doesn’t have a general release yet so it has to be found by those willing to explore its themes. Stay tuned for more interviews with Oscar contenders in the coming weeks. Mina Takla is a foreign correspondent for AwardsWatch and the co-founder of The Syndicate, an online news agency that offers original content services to several film brands including Empire Magazine’s Middle East edition and the Dubai Film Festival. Takla has attended, covered and written from over 10 film festivals online including the Dubai International Film Festival, Abu Dhabi Film Festival, Cannes, Venice and Annecy Film Festivals. He has been following the Oscar race since 2000 with accurate, office-pool winning predictions year after year. He writes monthly in Empire Arabia, the Arabic version of the world’s top cinema magazine and conducts press junkets with Hollywood stars in the UK and the US. He holds a Master’s degree in Strategic Marketing from Australia’s Wollongong University and is currently based in Dubai, UAE.